"Welcome to the world of Tempus. lt is the dawn of time for mankind. Tribes lie scattered across the land, living in huts and hunting for survival. However, the spark of civilization has been lit and the peoples of Tempus will take their first steps towards what will become the modern world. Each turn players draw a card and play a card to add to a route, the card played must link to one of the ends of the route, otherwise the existing route must be discarded and a new one started. Following card play, the route may be scored or left to be extended the following turn. 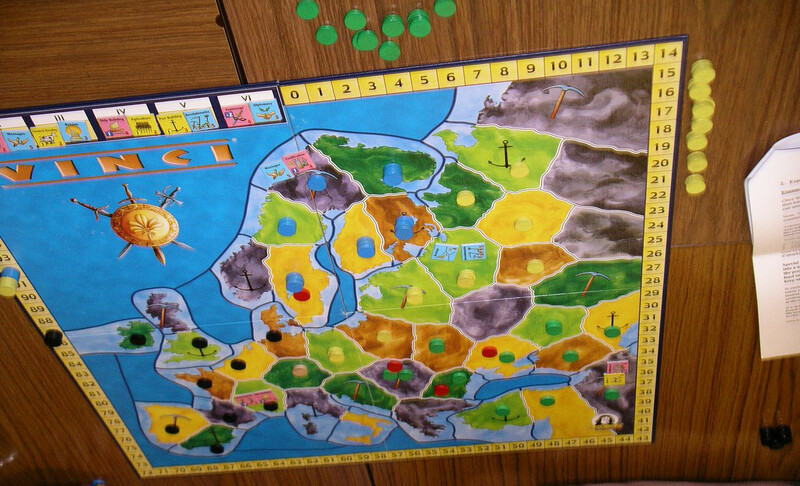 Scoring a route allows the player to place post offices on the board and score points for the length of route and one the basis of the location of theor post offices on the board, also to gain succesive carriages. The winner is the one with most points at the end of teh game after decutions for unplaced post offices. "A series of devastating tornadoes, unleashed by enemy mages in the recent war has left all the kingâ€™s castles in ruin. Only the foundations of these once magnificent monuments remain. The war not only robbed the king of his castles, but also of his youth. The now elderly king must choose a successor from among his sons. He has charged them with rebuilding his castles and promised the throne to the one who can rebuild the tallest and largest castles. Tired of war, the king requires that the building be done in peace and a spirit of cooperation. Thus, the princes may not attack each other or the castles being built. Each prince has 6 knights to supervise the building. Two or more princes may work together on a castle with their knights competing to control the highest towers of the castle. The king will spend each year in a castle and will reward the prince whose knights are guarding him. "The Maya was a highly developed civilization known for its unique art, complex architecture, sophisticated mathematics and advanced knowldege of the visible universe. At the heart of their society was the mysterious Tzolk'in - a 260 day calendar that used the movement of the planets to predict the right time to plant seeds, perform ceremonies, and build monuments. Will you become one of the Ajaw, the leaders of Mayan tribes, worshipping the gods and leading your civilization to prosperity? 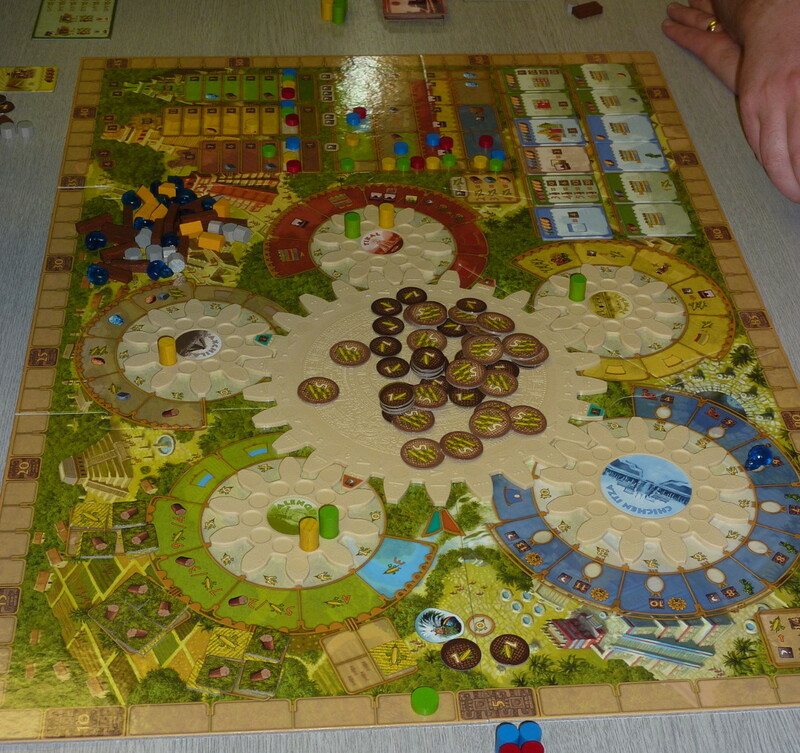 The center of the game is Tzolk'in calendar - a set of gears that rotate through the rounds of the game. Your planning will nedd to account for a continually changing game board. Harvest crops extract resources, build moneuments and beware the wrath if the gods." - Back of box. 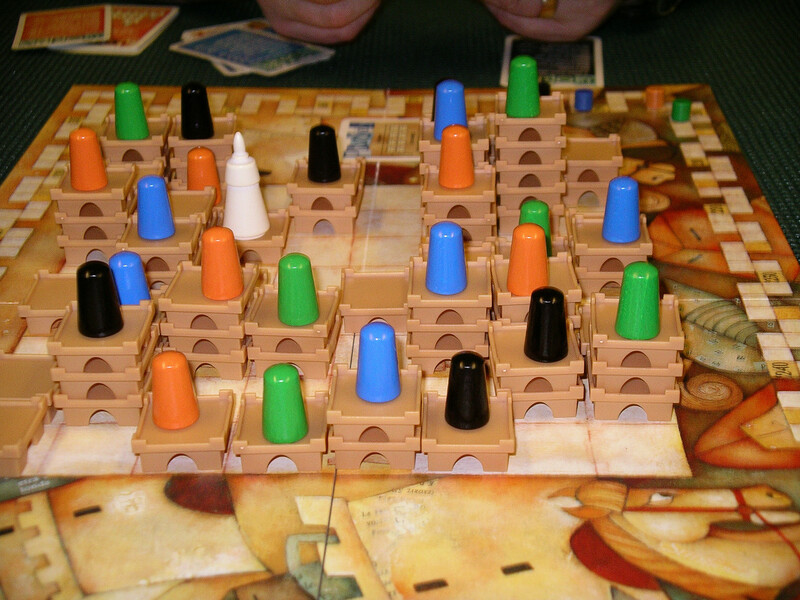 "A game of Vinci spans the growth and decline of civilizations in Europe from Prehistoric times to the High Middle Ages. During this long period of history, new tribes and civilizations made their mark upon the continent in many ways. Wandering into Europe from across the Mediterranean, the Atlantic Ocean, and the Ural River; or rising from the ashes of previous civilizations. The civilizations spread, made war upon each other, assimilated each other, and eventually vanished to make room for new and growing empires.